Although still abundant compared to some other sea turtle species, olive ridleys are threatened. The International Union for Conservation of Nature lists them as Vulnerable on their Red List, meaning that the populations of this small species of sea turtle, who grow to about two feet in shell length and weigh a little more than 100 pounds, are susceptible to anthropogenic threats. Numbers of olive ridleys in particular are in decline. Their eggs are considered a delicacy and are highly sought after, while adult turtles are targeted for their meat and shells and also perish as part of incidental catch by fishermen. They are also threatened by habitat loss. These turtles live in tropical waters around the world, where they feed mainly on jellyfish, sea urchins, snails and other marine invertebrates. 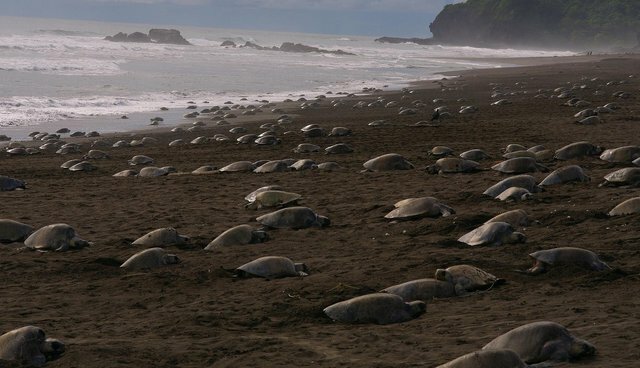 Olive ridleys are best known for their synchronized nesting in mass numbers (referred to as arribadas), during which some 600,000 individuals have been observed nesting in one location over the span of a few months. 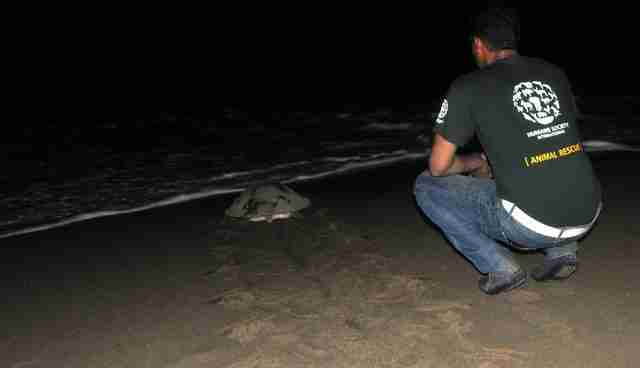 On the coast of Odisha, India – famous for its olive ridley nesting grounds – Humane Society International has partnered with Action for Protection of Wild Animals in an effort to save these animals. A 2012 survey in the area found that more than 95 percent of hatchlings did not even survive long enough to reach the ocean; today, our team patrols the beaches to ward off predators and poachers and provides education and training to coastal communities, to ensure that as many turtles as possible make it safely to the water's edge each season. This year alone, we protected more than 700 female turtles and more than 60,000 eggs, with a total of 36,000 hatchlings released safely to the sea. What's more, we trained almost 50 members of area communities in the protection of olive ridleys, and reached about 2,500 people through programs to raise awareness of the issue. Eleven local schools also participated in beach clean-up programs, with more than 100 students and teachers taking part in the effort. Participation by locals not only provides useful hands-on assistance; it gives people a stake in the fate of the animals they spent time trying to help. 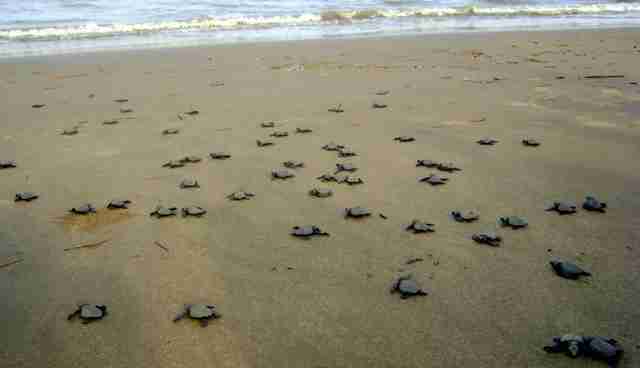 Patrols remain the most effective way to protect hatchlings and nesting females. 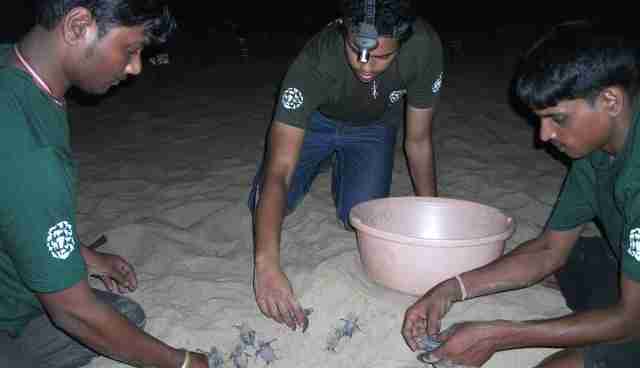 The project has enlisted 10 guards-young men from nearby villages-who are charged not only with watching the beaches to ensure the turtles aren't harmed, but also recording data pertaining to mothers, eggs and hatchlings. They keep the nests safe from invasive predators and aid the hatchlings in their perilous journey from the nest to the sea-one that many would not survive if it weren't for this benevolent intervention. Through the project, essential information is gathered, to be shared with the Ministry of Environment & Forests in India as well as other organizations that are working towards conserving these creatures. It is our sincere hope that through protection, research, education and community participation, we can help keep olive ridley numbers from declining any further in this region.